Keeping your productivity high is an absolute necessity for any go-getter. There is nothing more important than making sure you don’t get so exhausted and tired that you can achieve your passions and goals. So today it’s my mission to help you stand strong with my nifty secret productivity tips so you can keep transforming the world while cool and collected. This is a biggie. Saying yes to everything. While it might make you feel like you are doing a lot and helping a lot of people out, you are really spending unnecessary non-recyclable time doing things. The Fix? Decide on your mission and when you get an offer, run it by your mission to see if it lines up. If it does, say yes. If not, graciously decline – it’s ok (and sometimes courageously kind) to say no too. This can be so overwhelming! And make you unmotivated to even start checking things off the list! The Fix? Keep it short and sweet. Just write the most important tasks out for today. Prioritize baby! Your brain doesn’t know which one is the best one to do first when it looks at your to-do list, but you do! The Fix? Decide what has to be done, now, later today, tomorrow, next week and put numbers beside them. Don’t do a number 3 until number 2 is done! If you don’t have a reason for doing something, what’s the point? If you know you absolutely must write a guest post so then you can share your message with the world and bring in more people to you so you can help them on a regular basis, then that pitch doesn’t seem so challenging anymore, does it? The Fix? Have a reason or reminder word written next to each one of your tasks to remind you why it is so important to your end goal. 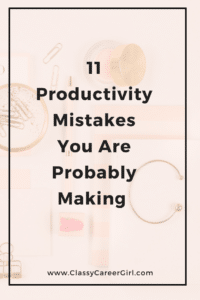 This productivity mistake is actually about doing less, not more.You are not running a marathon, you are trying to enjoy your time here on this earth. Get what you need done but don’t sacrifice yourself in the making of it. We need you sweetheart! The Fix? Take scheduled short breaks – if you know you need a schedule or you will never get back on track, put reminders on your devices to breathe, get water, stretch or close your eyes for 30 seconds, etc. “It has to be done today or else the big bad to-do list wolf will get me!” – It won’t and sometimes it can wait. You come first gorgeous so take care of yourself first. You can’t expect to be on fire with love and passion if you don’t give yourself the time of day. The Fix? Pay attention to yourself. Set a reminder on your phone to spend 5 minutes checking in with yourself daily. A good reminder is “How are you feeling and what is happening in your body right now?” Listen and take action. “I’m a great multi-tasker!” – This is something I don’t buy. If something is serious enough for your end goal, you need to spend some quality time on it. The Fix? Shut off those distractions and this means your phone, TV, facebook, twitter, reminders, boyfriend, kids, cat, dog, wind, washing machine dings and internet. You want it done? You will be surprised how little time it takes and how revved up you get when you are focused while completing your tasks. “Oh, I will just do it in my free time.” – When is that? We always expand to our means. If you have more money? You may have more things to spend it on. More clothes? You will have more changes of outfits. Get the picture? If you are relying on your “free time” chances are you will never get it. The Fix? Schedule it in and stick to it. It may be unsexy but if it’s not in the diary next to the dentist, your free time may not happen. “My reward is doing the task.” – Maybe not if you have a choice of writing that boring meeting agenda or having your lunch break now. The Fix? Have a reward – what’s something that you really love to do? One of my rewards is getting a smoothie at my favorite cafe or a free no work spontaneous night. Pick a few: some expensive and some absolutely free (great food, long shower, early to bed) and put one by each task. At the end of your to-do list or week, you will have a very rewarding schedule created for you by your great work! “I always do my tasks, I don’t need extra motivation.” – Yes, but how much more extra time is it taking you? How fast do you move if you think you will be hit by a car? That’s because your brain wants to keep you safe, alive and happy. The Fix? It’s called the carrot and the stick. The carrot is the reward and the stick is a consequence you really don’t want to do. For those tasks you get really stuck on but know how beneficial they are, use a stick. Some of mine include no makeup for a day, eating vegetables for dinner every night, no fruits in juices, no internet, etc. “I can’t, I’m not ready, I don’t know how or I don’t want to.” – Our brains love these stories because they are safe. But what if you are still in the same place in 10 years saying the same story and doing the same things? Today’s post is written by Rebecca Hulse, a women on a mission to love and empower women to create their best life everyday. She coaches women, teaches laughter yoga and continues Hulse Family Legacy at rebeccahulse.com.